The first thing people notice when they meet and talk with Health Haven owner Donna Wood is her passion for what she does. As soon as someone enters her bright and welcoming store on Main Street, Donna greets them with a smile and sincere interest in helping them find exactly what they need. As a certified nutritionist, Donna offers customers substantial knowledge about health issues, dietary concerns, and wholesome life strategies, and she sells a wide variety of products to meet specific goals. Her mantra is “People over Profits,” and she isn’t satisfied until her customers have found solutions and feel comfortable with their purchases. Health Haven’s tidy shelves are brimming with an extensive line of dietary supplements and remedies, natural health and body care products, and holistic items designed for children and even pets. Adding a unique dimension to the store, Donna makes an effort to stock locally sourced food goods such as honey and fresh eggs, as well as lotions, soaps and hand-drawn greeting cards in case you’re purchasing a gift. A soothing array of herbal teas, organic chocolate, and incense are on display, and the store’s walls and often her front window are decorated with artwork by local artists and Moorestown’s students. “Art and creativity are important parts of being healthy,” Donna maintains. Donna opened her Moorestown store three years ago while still operating her flagship Health Haven business in Hainesport, which she launched in 1982. “From the moment I started the process of the new location, I felt supported by everyone in Moorestown who helped me take this step,” she explains. “A local bank eased the process of a business loan, the landlord was very accommodating, and township groups embraced and supported my endeavor.” She was excited to be a part of a municipality with a vibrant Main Street and grateful for the encouragement and connection she felt from Moorestown’s community groups. In time, she decided to sell her Hainesport location to focus on her new store, which has become a popular and inviting fixture on Main Street. Donna believes the advantage of having a small store is the immediate feedback she receives from customers. “People will come back and tell you what works and what doesn’t.” When a product isn’t the right fit, Donna maintains a 100 percent return policy and then makes a point of finding another product that meets expectations. She truly enjoys the experience of working with people one-on-one and counseling them. “Ultimately, what’s important is that customers feel good,” she says emphatically. From encouraging passersby to stop and rest at the table in front of the store, to offering a selection of free informative health pamphlets, to the “Welcome to our Home” sign just inside the door, Donna has created a warm and appealing destination dedicated to wellbeing. 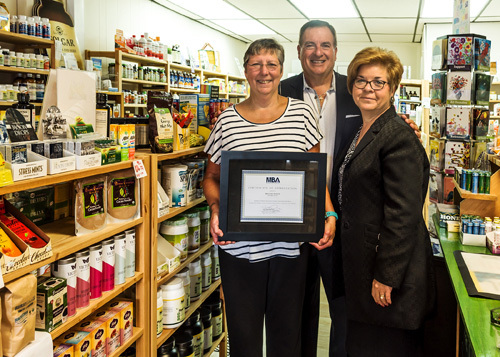 Her customer support, positive attitude and determination to create a “haven” on Main Street led the MBA board to recognize Donna Wood and her store for enriching Moorestown’s business community.